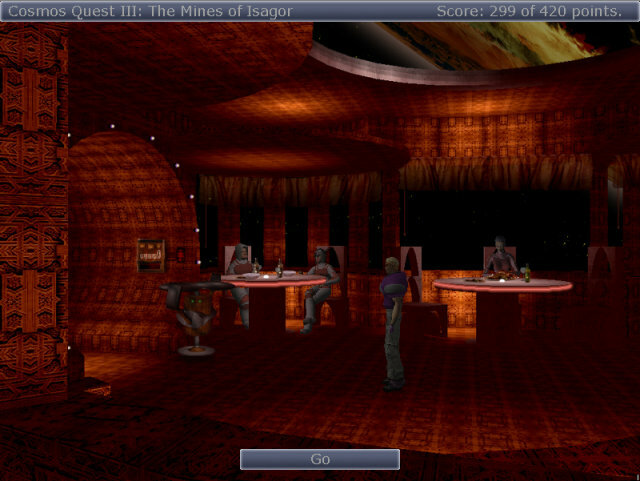 Cosmos Quest is a free point-and-click science fiction game inspired by Space Quest series. The game is created with AGS. On the left is a cabinet. It’s locked but when you use the crowbar on it, you’ll find a KEYCARD and a BATTERY inside (10/84). Look inside the cabinet again to see a label with strange signs on it. You need to remember these. Use the keycard with the reader on the back wall. You hear the sound of an opening door again (4/88). Walk down the steps and through the door on the right. You smell oil and you’re allergic to that so you need to be quick. Use the robot in front of you and enter the top row of symbols you saw in the cabinet: number the buttons from 1 to 12 from left to right and enter: 4, 2, 7, 6 and 5. Push button 12, the green arrow and the robot will take care of the elevator (7/95). Walk to the door of the elevator and it’ll slide open. Use the door of the elevator to enter and use the panel inside to go to the level below. You’ll see a Harg guarding something. Keep inside the tunnel opening because you can still sneeze because of the allergy. The Harg will leave and when he does, walk to the location he was standing. Pick up the plastic CANTEEN (5/100) and when you walk to the right, there’s a safety net. In the net is a REMOTE CONTROL. Pick it up (7/107). Since you’re still sneezing, you can’t go further. Walk through the tunnel opening to the left and go up the ramp to the left. Walk up the steps on the left and leave the bunker on the left. Outside, use the canteen on the WATER (10/117) and in your inventory use the anti-allergic pill with the canteen (15/132). You decide to drink to solution to kill the sneezing (10/142). Walk to the right into the opening again and go down the steps. Go through the door on the right and walk into the elevator. Use the panel in the back again to return downstairs. Look at the remote in your inventory. The battery is dead. Use the battery you still have with the remote to revive it (8/150) and wait for the Harg to leave again. Use the remote on the receiver hanging on the far right at the bottom and a cart will take you into the mines (12/162). Here you’ll overhear a conversation between Hargs. Standing behind the barrels, the Harg can’t see you, so don’t move (you can’t). Pick up some ORE from where you’re standing (3/165) and use the ore on the panel on the left. The Harg will leave (20/185). Look at the hole in the barrel on the right. Use your canteen with the hole in the barrel to take some of the OIL (8/193). On the back wall is a WEIGHT BALL. Although it’s heavy, take it (6/203). Leave the room on the left and find Nia locked up. Then there are footsteps… When the Harg is gone again, give the teleporter to Nia and she’ll tell you about the solid door between the cells (20/223). Talk to Nia again and ask about the signs on the door. She’ll tell you about the rotated C and a mirrored L (10/233). Walk to the right to enter the room you hid before and find a panel. Number the buttons from 1 to 12 from left to right and push number 5 (15/248). The door between the cells will open. Now that the crew is safe, you need to get out of there. Walk to the left and walk into the elevator on the lower right. This will take you to the upper level again. There’s a Harg patrolling and you need to get rid of him. In your inventory, use the crowbar with the weight ball (20/268) and use the combination on the steel rope leading down. This knocks out the Harg for a few hours (25/293). Walk further to the left to find the spacecraft. Use the spacecraft to find out it’s out of fuel. Use the canteen with oil on the feed-tank opening on the side of the ship to fuel up (6/303) and use the ship again to go inside. Time to leave Isagor. The authorization system has detected you as an intruder so you had to land at the nearest location possible. Walk through the tunnel on the right to enter the restaurant. Try to talk to people to realize you need a translator. On the wall near the entrance is a vending machine. It sells translators but you need 3 Zinki coins for that. Look at the serving droid as it passes and realize it’s an old model (2/305). Talk to the droid to see that they are not smart and controlled from a remote panel (2/307). Walk to the right twice to find an empty table. On the wall in the back is a panel to control the serving panel. Look at the panel and all lights are green. Leave the panel and take a KNIFE from the stand on the right (5/312). Use the knife on the STRING of curtain hanging on the left (10/322). Leave the room on the left and return to the right. Look closer at the panel again to see one of the lights now flashing. Push the button next to the flashing light (5/327) and walk to the left twice to see the droid serving the table. The droid will drop a coin. Pick up the Zinki COIN (8/335) and look at it in your inventory. It has a hole in it. Use the string with the coin (12/347) and use the combination on the vending machine to buy a TRANSLATOR. Talk to the Ada woman on the right and keep talking until she tells about her friend in the gambling room in the restaurant (5/352). Walk to the right and talk to the Barabat guarding the entrance. He’ll tell you you need a membership card. Walk to the right to the room with the panel and find a chef behind the counter. Talk to him and he’ll tell you about the failing droid. Give him the droid-2-droid brochure and he’ll give you his MEMBERSHIP CARD (10/362). Walk to the left and give the membership card to the Barabat. Walk into the game room and watch the men playing. Look at the Ada male to realize it’s the friend the Ada woman is waiting for. He’s ruining his relationship. You’re standing next to a heater with opium fruits on it. Using your opium fruit with the ones already there will ruin your fruit so use your knife on your fruit to slice it (6/368) and put it with the other fruits on the heater. Everyone will pass out (10/378). Next to Harg-Xoval is a paper folder. Use it to get some important DOCUMENTS concerning the rights of the mine (10/388). Search the body of the Harg-Xoval to get an AUTHORIZATION PASS (15/403). Walk to the left until you reach the spacecraft outside. Walk towards the spacecraft and use the hatch to enter. You’ll be able to fly away from the restaurant (17/420).